On Monday, October 15th, the Hillsborough Jr. Raiders held a ceremony at the municipal building to honor their highest achieving student-athletes. Each marking period, the Jr Raiders organization holds a ceremony and presents certificates to their students in grades 5 through 8 who have achieved straight As. In addition, special recognition is given to the students who achieved straight A’s for the entire school year with an additional achievement gift. Mayor Gloria McCauley, who attended the ceremony, was impressed by these outstanding students who are not only successful in their athletic endeavors but, more importantly, manage to achieve academic excellence as well. Students honored for achieving straight A’s for the 4th marking period of the 2017-2018 school year are: Alexa Gibson, Maggie Chen, Matthew Gaspar, Morgan Benosky, Samantha Green, Scarlett Rose Bottone, and Shane Donoghue. 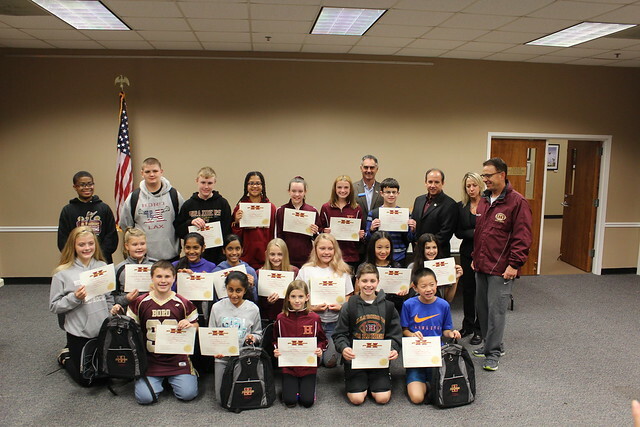 Students honored for achieving straight A’s for the entire 2017-2018 school year are: Addison Harkin, Ananya Kabbinad, Carson DeRoner, Charlotte Maloney, Chiemelie Ozokpor, Emma Kelner, Isabella DiStasio, Jake Battagliese, Lauren Crino, Lauren Flynn, Matthew Goldman, Matthew Jones, Max Chen, Nadia Siwiec, Pierce Skala, Saranya Shiva Shankar, and Vandana Iyer.